If there's one thing the web has done for us more than anything else it's provide an endless stream of new information. Suddenly everyone is an author, everyone is a publisher, and all those thoughts and opinions that were tucked up inside peoples heads are now broadcast far and wide across the Internet. 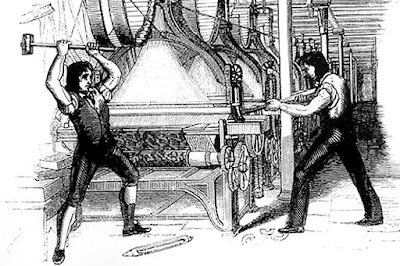 It's created a real challenge for educators; previously we had mostly curated sources, libraries chock full of texts that had already been specially filtered for the school that was to become their new home. Now, often the first challenge when investigating a new topic, and being faced with the oceans of information online, is to try and work out which ones are worth reading later and which you can safely ignore. Which brings me neatly to this Fridays app. Once it was called "Read It Later", but now it's simply referred to as "Pocket". Pocket's original name, "Read It Later", was (I thought) fantastically simple and descriptive. For once you didn't have an app that tried to make a pronounceable word from far too few vowels (Quizziz, I'm looking at you), or manage to murder a perfectly innocent part of the English language by mashing it into something unrecognisable (Hello, Todoist), instead the apps name captured perfectly what it actually did. 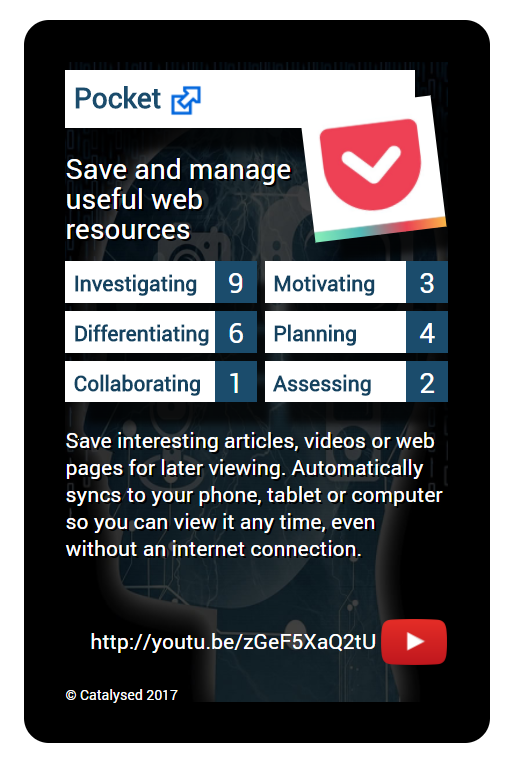 An app that allowed you to save something online, so you could Read ... It ... Later. Still, Pocket's a nice enough name for it too. Pocket is a web service for storing and curating information online. Basically, you install a button on your browser, or an app on your phone, and then whenever you come across something on the web that you'd like to pay more attention to, but don't perhaps have enough time to dedicate to it right away, Pocket will allow you to save it and ... wait for it ... read it later (you can see why I liked that name now :-). Articles are added to your own personal webspace, and what's more most of the extra web stuff that you don't need, e.g. adverts, navigation buttons, comment sections, etc., are stripped out, leaving you just the article you wanted to read, free from distractions. It'll work for text articles, videos and images, and what's more you can tag anything you save with your own set of free form tags, helping you to create your own personal folksonomy of curated information. All the articles you save will be synced to whatever digital places you use Pocket in, and the key ones automatically downloaded for you so you can read them on that long tedious flight to that conference you need to attend. As you'll see from the Tech Trumps® card above, Pocket is particularly strong on Investigating, so let's look at that aspect in particular. 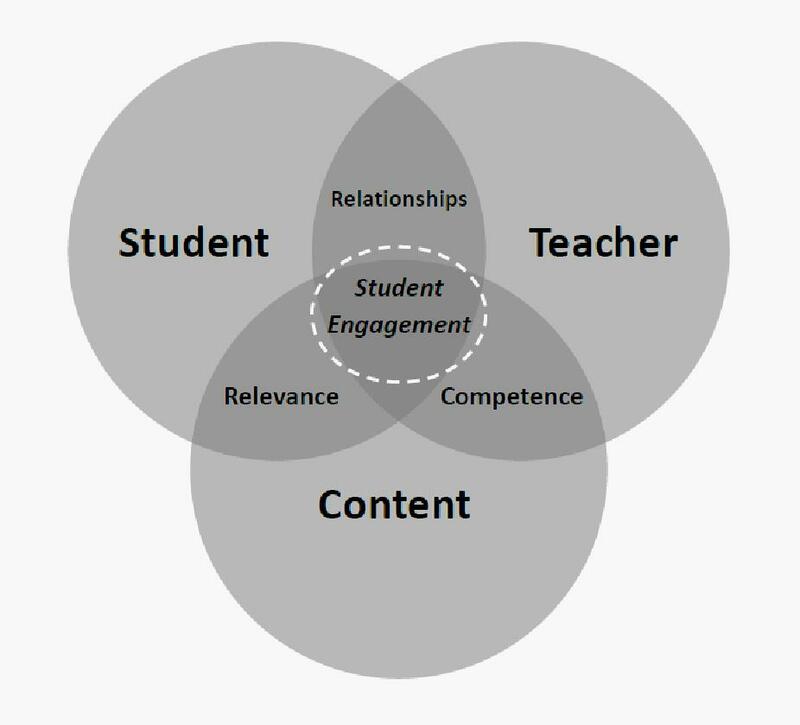 As I said in the intro to this blog, a key challenge for educators today is to make sense of the wealth of information available out there. Much as learning is about expressing ideas and exploring different perspectives between individuals, and old fashioned ideas of simply transmitting information directly into the heads of students are (quite rightly) widely frowned upon, there's no getting away from the fact that at some point you need new context to explore together. 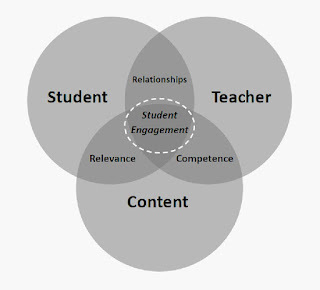 I think it's fair to say that all (formal) education can be seen as something of a triangle relationship, with the three points being the teacher, the student, and some content. With that in mind, Pocket can be a valuable way of gathering that content, and using the tagging system to organise it to suit your needs. You might do that on a subject basis, for example, perhaps using terms from your discipline such as photosynthesis, catalysts or motion (I'm a Science teacher - can you tell?). Alternatively, you might choose to do it by class, e.g. 8XB or 9X1. Or combine the two, whatever works for you is the key. Once saved you can come back to them whenever you want, archive them if they're no longer needed, or share them with your class or colleagues using inbuilt sharing tools. Of course, it's not just you as a teacher who needs to organise and curate information, but also your students. Pocket can be a handy tool for them too, either allowing them a space to curate information they find online over an extended period of time, perhaps building a library of resources for revision, or for one off projects. The way Pocket strips out extra rubbish, focusing on just the content, can help to focus students attention. It's ability to sync across devices means they can save something on a desktop, which is often an uncomfortable interface to read on, and then come back to the article later on a tablet device in comfort. Finally, Pocket can be a useful way to actually explore information relevant to what you've already gathered. Like many apps today, it uses algorithms to find new content for you based on what you've already found, and then adds them to an extra "Recommended" page on your personal dashboard for you to explore at your leisure. This comes with the caveat that you might find yourself exploring in something of a hole of your own making, but nonetheless can be a useful way of extending existing searches automatically. In research we often use the literature review from one paper to find new papers to read, and the Pocket "Recommended" page works in much the same way. So that's about it for Pocket - it's a simple tool, but it does what it does extremely well ... even if it no longer says quite so much on the tin. Do you have any ideas for using Pocket that you'd like to share? Please feel free to add them in the comments. Looking for more edtech? 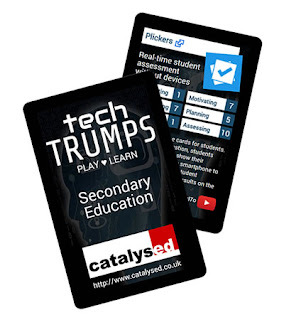 Head over to http://techtrumps.co.uk to see Pocket and a host of other apps for teachers. You can also buy your own pack of cards for only £8.99 (plus postage) direct from Amazon.co.uk (also on Amazon.com for my US readers). With your own pack of cards you can browse at your leisure, or play a game with your colleagues. Have fun, and discover new apps at the same time!